There are no Old Hunter Summons in this area. Sinister Bell Ringer (Online): Bell Ringer is located at Mergo's Loft: Base, Infested Chapel right Balcony; Mergo's Loft: Middle, at the end of the Moonlit Path at Mergo's Loft: Rooftop (all present from the start). When “bell-ringer woman” is present, versus PvP invasions are possible. Pick up the Eye Caryll Rune from Mergo's Loft: Base. Get the Moon Caryll Rune from the Library Staircase. Go to the Chapel Rafters and get the Choir Bell. Drop down through the Crumbled Wall on the Middle Bridge to reach the room containing the Blood Rock. Defeat Mergo's Wet Nurse to obtain One Third of Umbilical Cord. There are no threats in the area when you start, so head through the tunnel at your leisure. When you get outside, off in the distance you should be able to see a Loran Silverbeast standing with its back to you. As long as you approach quietly you can sneak up behind it and use a charged R2. Don't let the Loran Silverbeast go too far up the trial, because there's a Wandering Nightmare that's better left undisturbed until you're ready to fight it. When you round the corner near the end of the trail you'll be under the gaze of the Brain of Mensis, so quickly run ahead and take cover near the Nightmare of Mensis Lamp. Watching over this entire area from its position on the Middle Bridge is the Brain of Mensis; any time you're in its field of view your health will slowly drop, and Frenzy will build up. Thankfully there's a lot of cover available in the area, and as long as you're standing directly behind something it will not be able to see you. There's a small window between when the Brain first spots you and when your health begins to drop, so if you listen for the sound it makes when it detects you, you can often get behind cover before taking damage. Enemies can also be damaged by the Brain's gaze, however, so it can be beneficial to try and lure them into its field of view - so that they are already weakened when you start to fight them. There's not a lot of cover available along this path, so you should try to sprint across the open areas to avoid being exposed to the Brain of Mensis for very long, and then wait for the Frenzy build-up to subside whenever you reach some cover. There's a group of Giant Lost Child enemies about halfway along the path, and the safest way to deal with them is to run straight past them to the Mergo's Loft: Base Lamp. This should entice them to move out from behind their cover to follow you, exposing themselves to the Brain's gaze in the process. The area around the Lamp is outside Brain's field of view, so you won't have to worry about it while fighting the enemies there The switches in the area control elevators, but they need to be activated from the other end, so you cannot make use of them yet. While there's quite a lot of cover available on this bridge, fighting any of the Silverbeasts nearby on it is extremely dangerous - not only because of the likelihood that a fight will take you out from behind cover, but also because of the bottomless drop on either side. It's much safer to lure the first enemy away from the start of the bridge and kill it before crossing, and then once you get close to the other side, quickly run across and fight the other enemy there. The hill leading up to the chapel has a number of Giant Lost Children along it. While here you'll need to stay aware of your surroundings and try to keep your camera aimed up the hill as much as possible, so that you can spot any incoming boulders. The first enemy will not actually throw boulders as you approach from this direction, so you can quickly close in and fight it on the small ledge it's standing on. Once you reach the enemy, however, a third one near the top of the hill will start throwing boulders down at you. Instead of fighting the one straight away, it's better to run up the hill and deal with the one there, because boulders thrown by the one down cannot reach you there. Another Giant is crouched down, and you'll have to run past it to reach the one behind, waking it up in the process. If you kill the Giant quickly, however, you can have it out of the way before the crouched one is ready to fight. Once the enemies at the top of the hill have been killed you can run back down the hill and finish off the remaining one without having to worry about incoming boulders. A Large Nightmare Apostle, along with some smaller Nightmare Apostles, can be seen hanging from the roof of the chapel when you get near the entrance, and as you'd expect, they will not remain there for long. If you were to run straight to the middle of the chapel, all of them would descend at once, which can make the fight quite difficult. To make things easier, use ranged attacks to lure them down one at a time. 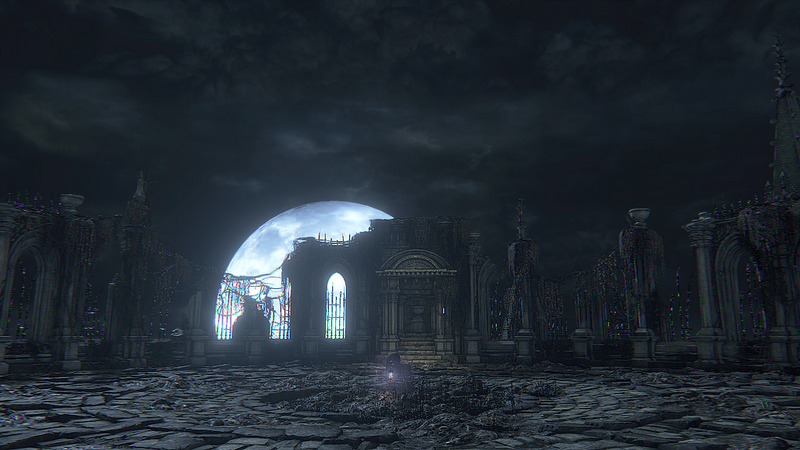 After the first couple, you'll have to use the Chapel Hallway to reach the rest without being detected, but doing so will allow you to fight the Large Nightmare Apostle on its own. If you do trigger them to fall, the fight is best handled near the entrance doorway, as the Large Nightmare Apostle cannot fit through it. The smaller ones will still come through the door, so make sure you back away far enough that you're out of range of the large one's attacks before fighting them. In the middle of this hallway another Nightmare Apostle can be found hanging from the ceiling, but you can run straight past it without it dropping down and get the item at the end if you wish. The small bridge leading out to the side of the hallway has a couple more of them hanging above it, and if you walk out-onto the bridge, the two above it and the one in the hallway will drop down to attack you from either side. If that happens, drop down off the bridge to create more space to fight them. The Hunter that you face on this bridge can be quite difficult to fight, due to the fact he'll often use Rosmarinus while walking backwards. The wide area of effect on that weapon makes getting past the spray on the narrow bridge problematic. To counter that, try to stay as close to him as possible and use the sides of the gate in the middle of the bridge to restrict his movement. Unarmed Mergo's Attendants patrol this area, but they will not become hostile unless you actually attack them. So they can be left alone unless you want the extra Blood Echoes. The chest on the balcony contains some useful Chalice Dungeon materials, so be sure to grab those before going down the stairs towards the Panopticon. The elevator that you can access here will take you down to a small room near the Mergo's Loft: Base Lamp, giving you quick access to a Lamp without having to fight any enemies or worry about the Brain of Mensis. Because of the ease with which you can now re-enter Mergo's Loft, it's worth returning to the Hunter's Dream to spend any Blood Echoes you've acquired thus far in the area. Upon entering the Library you'll notice a lot more unarmed Mergo's Attendants walking around, and as before, they will remain non-combative until you hit them. Heading around to the right will lead you to a small dead end, where an item can be found hidden behind a screen When you reach the top of the stairs to the left, look for a small balcony entrance behind the mirror nearby, that you can follow along to reach another item. The Panopticon is home to all types of Mergo's Attendants, and the constant threat of falling off the edges of the broken floor during an encounter makes the positioning with which you fight them very important. The most immediate threat is the Mergo's Chief Attendant that patrols between the cages; try to fight it as close to the stairs as you can, so that you keep the fight away from other enemies and give yourself the most room to maneuver. Interrupting their slow attacks and using a visceral attack while they're staggered is the fastest way to kill them, but for an easier option you can try quickstepping through their attacks and hitting them while they recover. An unarmed Attendant can be found hiding behind a pillar, but unlike the other ones this one will attack you straight away, so be ready for it as you pass the pillar. Towards the back of the room are three more Attendants, this time all armed with crossbows. You can approach them by going around the right-hand side of the pillar in the middle, but from that direction they all have good lines of sight over each other. Before you can go around the left side of that pillar safely, however, you'll have to contend with another Mergo's Chief Attendant standing near the elevator at the back. When you get close to that pillar, the Chief Attendant will spot you and start walking towards you, so wait for him to come past it and fight him there. When you go around the pillar you can use the first broken cage full of books for cover while you fight the enemy, before running down and killing the one near the screen to the side of the pillar. Use the other broken cage in the area to cover your approach while you close in and finish off the enemy. While it won't be here during your first time through the Panopticon, a series of events later in the area can cause a new cage elevator to become available at this point. Use it, and you'll descend into the abyss below to face off against an ancient evil. Before stepping onto the elevator here, go through the gap in the rail on the left and follow the path around to reach an item hanging over the edge, behind the pillar. It's worth noting that even if you used a lot of items getting through the Panopticon room, you're better off continuing, rather than going back to the Base Elevator, because you'll be able to open up another path to a Lamp shortly. The cage hanging directly in front of you when you enter this area contains a Dog-headed Carrion Crow that will come crawling out as you approach; these enemies attack in the same way as their traditional-looking counterparts, so don't let their appearance intimidate you. After following the path around to the right you'll find another group of Carrion Crows, feeding on the seemingly dead corpse of a Rabid Dog. When two of the crows have been killed, the dog will spring to life, so try to attack it while it's still lying down. At the top of the nearby stairs, you can double back around to the right and roll off the edge into the hanging cage to get the item that you could see in there while going up the stairs. On your way to the Elevator Station you'll come to a set of stairs leading down to the left, where a pair of Crow-headed Rabid Dogs are guarding some items. If you go down there, try to use the trees in the area to the block the dogs' attack attempts, and then kill them while they recover. Only one elevator at the station is currently active, but you can use it to descend to the path just in front of the Mergo's Loft: Base Lamp. This allows you to get straight back here without having to fight any enemies. There's a boss fight coming up shortly, so making use of the Lamp is highly recommended. While the reasons for having a bridge and a hallway cross the same room and lead to the same area may not be apparent at first, the metal bridge will get moved shortly, so you'll have to use the hallway during subsequent trips here. When you reach the other side, two Skeletal Puppets will spring to life on the steps, so have your weapon at the ready Walking a short distance along the corridor beyond those enemies will trigger the start of the boss battle, so make sure you're well prepared before continuing. This boss encounter differs from the others in the game in that it takes place over a large portion of the area, and it is primarily a game of cat & mouse. When you approach him, he will nearly always run away in the direction of the room, so he doesn't take much persuading. Any time you hit him before getting him into that room, however, he'll disappear in a cloud of smoke, and you'll need to track him down again; killing him in this manner does take slightly longer, but it lets you avoid dealing with his attacks. To impede your progress in tracking him down, numerous Skeletal Puppets will spring to life around the room, and while you can kill these enemies, doing so is only temporary and they will spring back up again after a short period of time. Unless one of them is blocking your way, it's best to just avoid and run around them There are two Skeletal Puppets in the first room that you trap Micolash in, but they will not become active until you get around half way into the room, which means you can lure Micolash back slightly and fight him near the entrance to avoid dealing with them. 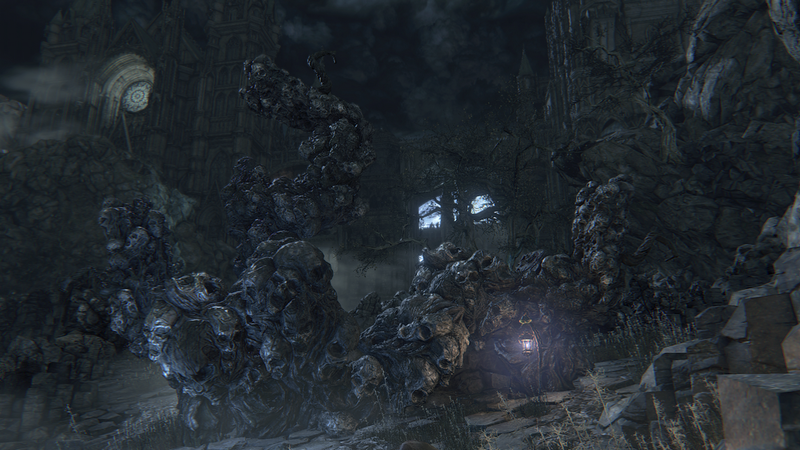 Once you get his health down to around 50%, Micolash will vanish and the nightmare fog will dissipate, allowing you to continue to the next part of the area. You can get the key to this gate in the area where you fight Micolash for a second time. Once you have it, you can return here to access the Middle Bridge if you wish. At this time the Brain of Mensis is still in position on the bridge and it's extremely difficult to gather the items out there while that's the case You'll have another chance to access the bridge later, after dealing with the Brain, so it's much safer to leave the items until then. You'll reach this large staircase on the way to the second part of the fight with Micolash, and you can either head down straight away and explore, or carry on and finish the boss fight first. The first enemy you'll run into while going down the stairs is a Wandering Nightmare, and you should try to kill it before it can run too far down. About halfway down the stairs a pair of crossbow-wielding Mergo's Attendants stand guard, so try to use the natural curvature of the wall for cover and time your approach between their shots. Another crossbow-wielding Attendant is at the bottom of the stairs, this time accompanied by a Chief Attendant, so you need to be a bit more careful. Hug the inside wall as normal, and then move out to get the attention of the Chief Attendant and lure it back up the stairs away from the other enemy before fighting it. Once all of the enemies have been defeated, you can safely pick up the very useful Moon Caryll Rune, that lets you receive more Blood Echoes for killing enemies. Heading up the spiral staircase will take you closer to the second encounter with Micolash, but before you get to him there are some other enemies blocking your way. The first one you'll come to is a flail-using Mergo's Attendant, and just behind that is another crossbow-user; try to lure the enemy with the flail down the stairs and fight it out of the other one's line of sight When you reach the top of the stairs, go through the archway to continue the fight with Micolash. 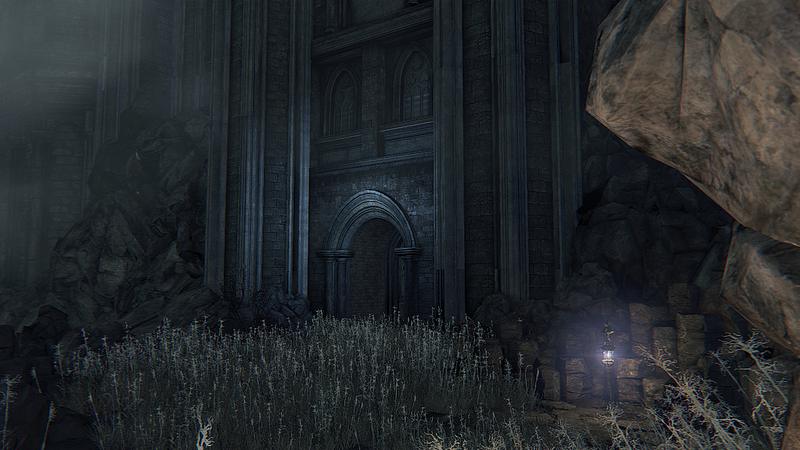 You can access this area during the fight with Micolash, or leave exploring it until after you've defeated him. The most important item here is the Iron Door Key, that lets you open the gate to the Middle Bridge in the first part of the Micolash fight.There's also a Kin Coldblood tucked away in front of one of the bookcases that you can use for some extra Blood Echoes. The basic goal is to once again trap Micolash in a room with no escape so that you can fight him, but this time he takes a bit of a scenic route to get there Micolash always starts halfway up the stairs, and if you run straight towards him, he'll go running, and then drop down, If you follow the same route he took you'll drop down behind him and he'll go running straight ahead into the dead-end room. Don't follow him in, though, because this time a gate will shut, locking him in, and if you're too close, you'll be locked in with him. While you can fight him like that, you can get a significant advantage by approaching from a different location. Make your way back up to the room at the top of the stairs, where Micolash entered the mirror, and go to, where you'll find a broken section of rail that you can drop through to land on a small balcony. Grab the item here, and then go through the nearby doorway and into the room beyond, where you'll find a hole in the floor. If you look down you should see Micolash standing below you. Although you may be tempted to drop straight down with a plunging attack, he will often move out of the way and avoid it. It's better to use ranged attacks from up here, where you're totally safe; Bone Marrow Ash-strengthened Pistol shots or Poison Throwing Knives are especially effective. If you run out of ranged options you can drop down and finish him off via conventional means. Upon defeating Micolash a cut-scene will trigger, during which the Vertical-lift Bridge will rise to its upper position. You can now access it from the room at the top of the area. After crossing the bridge you'll also be able to light the Mergo's Loft: Middle Lamp, so now's the perfect time to resupply. At the top of the first flight of stairs here you can double back around to the right to reach a small balcony, where two Dog-headed Carrion Crows are guarding an item. The item in question is two Bloodstone Chunks, so it's worth taking a quick trip in there to kill them and retrieve it, before continuing up the stairs. To the right at the top of the stairway is another area with multiple elevators. The elevator in the room is not usable yet, but the cage elevator can be operated, and will take you back down to the Elevator Platform. From there, you can take the other elevator down to easily reach the Mergo's Loft: Base Lamp if you need to. When you step onto the elevator you may notice that the cage door is broken and doesn't shut; that should be your first clue that there is something hidden nearby. Keep looking at the building during the elevator's descent and you'll notice an open window at about the halfway point. Since the cage door is broken you can roll out of the elevator and through the window to reach the Upper Bridge. Before heading out onto the bridge, be sure to open the nearby chest to get the Inflicted Organ ritual material. You should already be able to hear the song of the Winter Lantern from the bridge. Try to watch its movements through the archways and only go out onto the bridge when it's safe to do so. Use the cover on the bridge to work your way along it, and take out the Winter Lantern once you're close enough. You can skip killing these enemies and still make it across safely by using the cover, but since they have a high chance of dropping very powerful Blood Gems, it's worth trying to kill them. There are two more Winter Lanterns on the second half of the bridge, and it's much easier to kill each one as you come to it rather than sneak past them Just to be safe, however, you may want to put some Sedatives in your Quick Items if you have them. A very powerful Droplet-shaped Blood Gem that increases your Physical Attack by 18% can also be found here, so make sure you pick it up before moving on. This attic area is infested with a number of Human-headed Nightmare Apostles. Try to progress slowly and only fight them one at a time. If you get surrounded, retreat back through the doorway. The corridor at the back leads to another room with a hole in the floor, and there's a switch on a small ledge just outside. Pulling the switch will release the chains holding the Brain of Mensis in place, sending it crashing down to the abyss below. This will allow you to traverse the start of the area without having to worry about its gaze. After pulling the switch, return to the hole and drop through it. 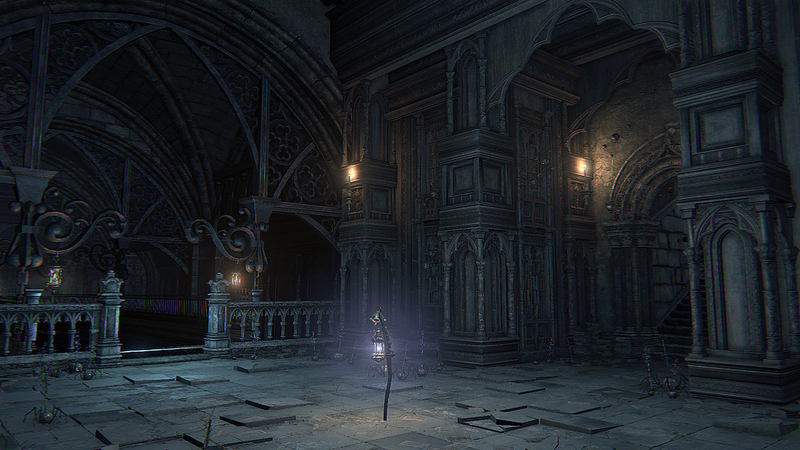 A Winter Lantern is patrolling on the other side of this room, so as soon as you land, quickly run behind one of the nearby pillars, so that you're out of its line of sight. Try to position your camera so that you can see where the Winter Lantern is, and when it's all the way to one side of the room, quickly move down and cross the beams at the opposite end. Be careful while crossing, because a fall from this height would mean certain death. Once you're on the other side, hide behind one of the pillars again and wait for the Winter Lantern to get close to you before attacking it. When the area is all clear, grab the Choir Bell from the chest, and then cross back over to the other side of the room to reach the Middle Bridge. With the Brain of Mensis dropped from its housing you're free to explore the Middle Bridge at your leisure, since there are no other enemies in the area. There are a large number of items to pick up from the corpses of the Brain's victims, including some more useful Droplet Blood Gems. If you go down the stairway near the end of the bridge, there's a path you can follow to reach the other side of the iron gate, leading back into the area where you faced Micolash. Near the center of the Middle Bridge there is a crumbled section of wall that you can walk through. This lets you reach the top of a room just to the side of the bridge, with a large hole in the middle, Look down over the edge first, and drop down very carefully. At the back of this room you'll find a precious Blood Rock, an item of extreme rarity. With it, you'll finally be able to upgrade one of your weapons to +10 when you return to the Hunter's Dream. The only way out of this room is through a small hole in the wall that leads out onto a ledge, from which you can drop down onto the Lower Bridge. While you're in this area it's the perfect time to head back into the Panopticon and use the now active Elevator to the Abyss to reach what remains of the Brain of Mensis. It cannot fight back and does not inflict Frenzy, so there is no risk in heading down there for the large amount of Blood Echoes and a rare Chalice Dungeon material that it drops. Before killing it, however, if you've been to the Upper Cathedral Ward and got the "Make Contact" Gesture, strike the pose in front of the Brain and hold it for a while to be rewarded with a high level Moon Caryll Rune. Once it's been killed, return to the Panopticon and use the Base Elevator to get back outside, from where you can use the cage elevators to get back up to the Upper Elevator Dock. Two Shadows of Yharnam can be seen walking away in the distance when you head down this path - try to catch up with them and engage them as quickly as possible. A third one that uses ranged attacks is standing atop a wall just beyond the first two. and fighting them before you gel in range of his attacks is much easier. If you have any Shaman Bone Blades, it can be worth using one here to make the two enemies fight each other. Otherwise, once you've engaged them you should bring the fight away from the third one to avoid getting too close to him. When you reach the base of this large stairway there are three possible routes that you can take: the main stairs going up, a smaller set of stairs going down to the left, and a ledge to the far left The narrow, ledge will take you around the side of the building to a hidden item, and the stairway going down leads to a small dead end area, which is where you'll land if you want to exit the Moonlit Path at this end. Following the rail around to the left after reaching the top of the Rooftop Stairs will lead you to a broken section that you can drop through in order to reach this path. If you took this path accidentally, you can take the small set of stairs nearby and drop down into another path, leading back around to the base of the Rooftop Stairs. By continuing along the path, you'll be able to kill a Wandering Nightmare for some more Bloodstones, and skip fighting the Maneater Boars along Boar Alley. Be careful when you reach the stairs at the end of the path, however, because there are two Shadows of Yharnam in a small balcony area at the top. Instead of going straight onto that balcony, walk slowly along the path until you see one of the enemies standing in an archway with its back to you - begin the fight with a charged R2 for an early advantage. Similar caution should be employed when you reach the top of the stairs just past the balcony, because there's a group of four Shadows of Yharnam patrolling in that area. Watch their patrol route and stick close to the wall at the top of the stairs; you can usually lure one or two of the enemies towards you at a time, so that you don't have to fight the entire group at once. You can also wait for them to have their backs to you and throw Pebbles to lure them for a slightly safer approach. At the top of the main stairs you'll see a Maneater Boar standing a short distance ahead, with its back to you. Approach it quietly and use a charged R2 from behind, following up with a visceral attack for an easy victory. Two more Maneater Boars patrol up and down the alley. Stay behind cover and wait for them to begin walking away, so that you can run up behind them and attack them before they can turn around. If you do get spotted early and one of them charges, make use of the trees and railings in the area to block the attack, and then kill it during the recovery period. You'll also run into the patrolling Shadows of Yharnam along this route. As you get near the alley it's worth hugging the building on the left and using it to hide your presence, so that you can use Pebbles to lure them out one at a time. It is possible to get the Maneater Boars to charge straight into them, but the timing required to set it up is quite difficult, so it will usually be easier to kill them all yourself. Standing outside the entrance to the boss area, you'll find the distraught Pthumerian Bride crying in anguish over the loss of her child. You cannot talk or interact with her, but if you return to where she is standing after defeating Mergo's Wet Nurse, she will graciously thank you and disappear. If you continue along the path past the bride, you'll arrive at an elevator that will take you back down to the Upper Elevator Dock From there, you have quick access back down to the Mergo's Loft: Base Lamp. The upcoming boss fight is very difficult, so it's highly recommended that you make the trip and resupply before confronting it. It can be extremely difficult to get close to this boss due to the large radius of its multi-hit attacks, so you may want to consider using Bone Marrow Ash-strengthened Pistol shots to weaken it from range. Upon defeating the boss you'll automatically receive One Third of Umbilical Cord, which is one of the items required to see the true ending, and the Wet Nurse's Lunarium Lamp will appear in the middle of the room.